Nothing special about them besides fonts/colors, so we've created them off camera. Like in Bite #99, we'll use Auto Layout Visual Format Language to pin the stack view's edges to its superview. Look at that, not bad for our first try! Ack! What the heck is going on here?! Let's break it down: In the default ‘Fill' distribution mode, if views don't naturally fill the axis of the stack view, the stack view will resize one (or more) according to their hugging priority (covered in Bite #69). We'll solve our issue by setting a low hugging priority on our label, signaling to the stack view that it be the one to stretch, not our image view. Shared Links Extensions arrived with iOS 9 and OS X El Capitan this year. They allow our app to insert content into the users' Shared Links section of Safari on iOS or OS X. 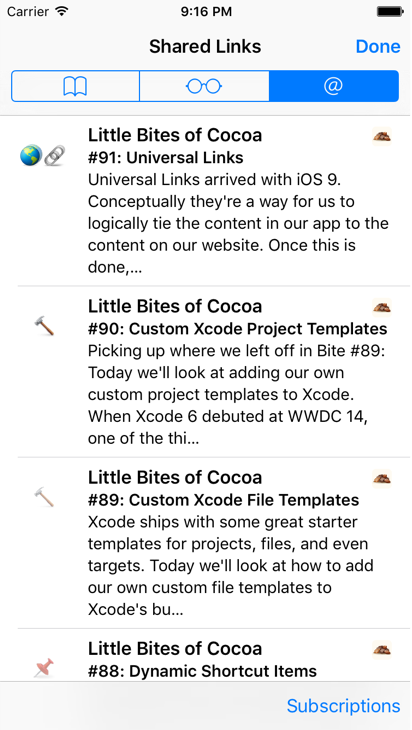 Let's add one to our fictional Little Bites of Cocoa app so users can see all the latest Bites right inside Shared Links. We'll start by going to File > New > Target... in Xcode and choosing a Shared Links Extension. This will provide us with a new group in our project with one file inside, called RequestHandler.swift. In this file there's one function called beginRequestWithExtensionContext(context:). iOS will call this on our extension and that will be our cue to run whatever code we need to load the content we'd like to show in Shared Links, then return it in the form of an array of NSExtensionItems. We'll return them via a completion function on the context we're passed in. 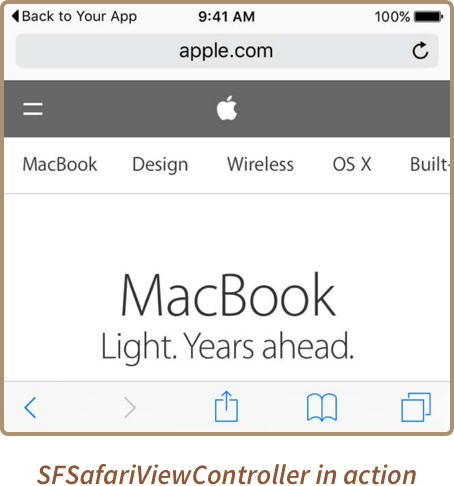 Lastly, we'll install our app, then head to Shared Links in Safari. We'll enable our extension under Subscriptions. Universal Links arrived with iOS 9. Conceptually they're a way for us to logically tie the content in our app to the content on our website. Once this is done, iOS will be able to launch our app when a user taps a link somewhere, rather than opening our site in Safari. Let's take a further look by adding Universal Links to a fictional Little Bites of Cocoa app. We'll start by registering and setting up SSL for our domain: littlebitesofcocoa.com. Then, we'll head into Xcode and to the Capabilities tab of our project. We'll flip on the switch for Associated Domains, then click the + button and add our domain. Note that we prefix it with the phrase applinks:. It will expect us to return some JSON which describes our app's Bundle ID, and which paths should open it. We'll open all paths on our domain using a wildcard character here, but we could easily, for example, limit to just Bite URLs. After creating the file, we'll need to sign it so it is returned with a Content-Type of application/pkcs7-mime on our server. We'll use a command like the one shown here to sign the file. (This part stinks, but there's no way around it). Lastly, we'll wire up the other side of the equation. When a user opens a Universal Link that iOS recognizes, it will call the same delegate function that's used to implement features like Handoff (Bite #29) and Spotlight Search (Bite #23). We'll check if it's a Universal Links activity type, then use JLRoutes (Bite #62) to open a section of our app. Testing is incredibly important in ensuring our app arrives to our users in as good a state as possible. Xcode has had great unit testing support for a few releases now, but testing our UI has always been a challenge. Instruments added support for it a while back, but it’s never felt like a first class citizen... Until now! Xcode 7 brings us an awesome, fully baked set of UI testing tools. We can even make Xcode write much of your test code for us by simply interacting with our app. Recording UI Tests couldn't be easier. We just write an new empty test function, put our cursor in the middle of it, and press record. UI Testing uses Accessibility under the hood to identify and retrieve UI elements at runtime. Just one more reason to make our apps as accessible as possible! 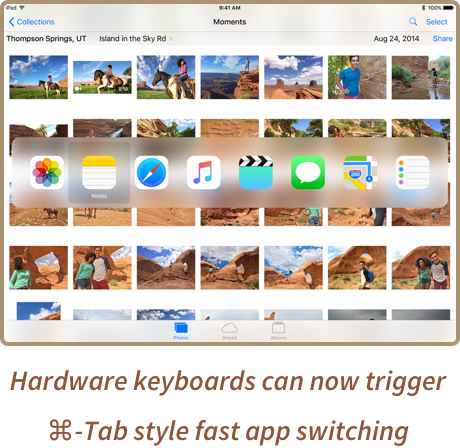 One of the coolest new features in iOS 9 is the new Picture in Picture functionality on iPad. This lets users watch video content from an app even while it's in the background. Then we'll use AVPlayerViewController to play video content. Picture in Picture mode will automatically kick-in if our app enters background but only if: 1.) our player is full screen, 2.) video content is playing in it, and 3.) Picture in Picture is supported on the device. If we need to support a generic AVPlayerLayer, AVKit also includes a new AVPictureInPictureController. We also get PIP for free in WKWebView assuming our app has the Playback audio session category set. Interacting with a user's Contacts database used to be, shall we say, "less than ideal". The AddressBook framework was great for it’s time, but it’s a bit past it's prime these days. 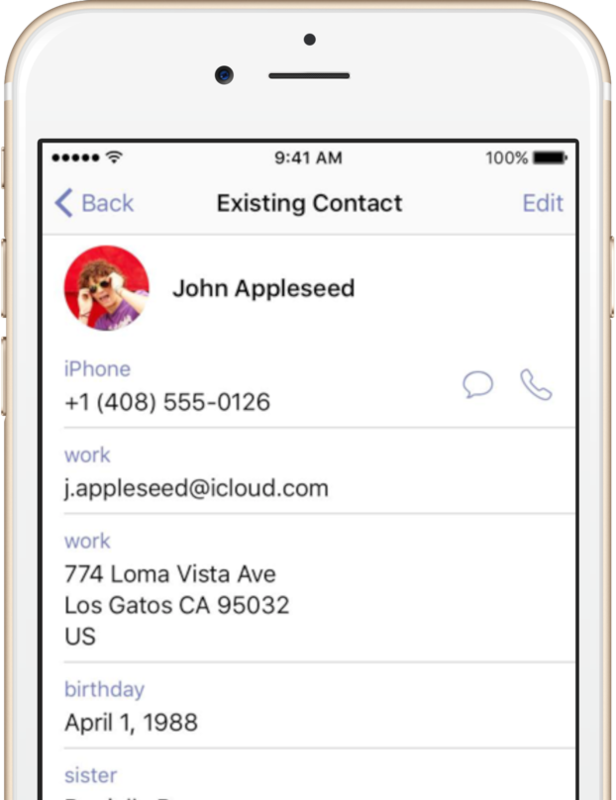 Contacts and Contacts UI are two new frameworks in iOS 9 (and OS X + watchOS) that make integrating Contact data into your app a breeze. Also, Apple has officially deprecated AddressBook and AddressBookUI so now's the time to make the switch! Core Spotlight allows your content to appear in the results of system-level Spotlight searches. attrSet.contentDescription = "CoreSpotlight allows your content to appear in the results of system-level Spotlight searches." 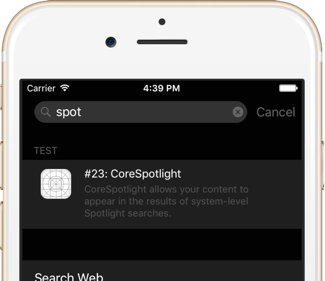 Of course Core Spotlight is just one of many ways to get your content into search results, be sure to also look into the NSUserActivity APIs as well as Apple's Web markup guides. Records app audio, optionally also records microphone audio. The user is given the chance to preview and, edit , and trim the video before exporting. You can't access the movie file itself. 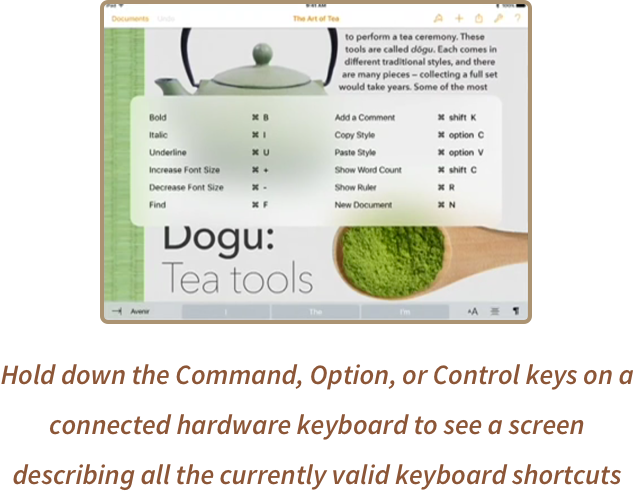 After recording, user is shown an activity view controller, which you can add custom actions to. Recording is polite to battery and performance. Only works A7 and A8 devices. Permission from the user is required to begin recording. Recording automatically excludes system UI like notifications or keyboard entry. summarized when the user brings up the new keyboard shortcuts view.